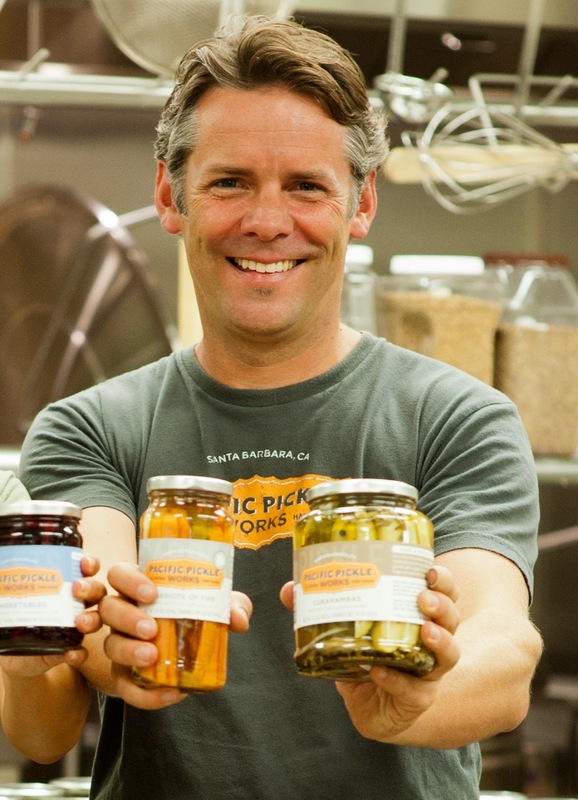 Southern Belle in Santa Barbara: Holiday Gifts: In a Pickle? It's the most wonderful time of the year, according to Andy Williams. According to me, it's the most hectic time of year! Don't get me wrong, I love this festive season (the twinkling lights, the scent of balsam, the Christmas carols, etc), but they don't call it "holiday madness" for nothin'! 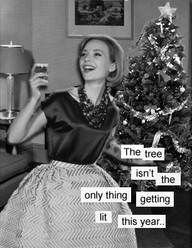 I finally got my tree up and now must turn my attention to finishing up my Christmas shopping. Christmas is less than 12 days away now. Yikes! I'm always on the hunt for good gifts but finding them isn't always easy. I've spent countless hours in the last month scouring the Internet, catalogs and stores for something that fits the bill. There's no lack of inventory out there, but everything seems pretty ho-hum. I like unique, thoughtful gifts—often that you can devour. I'm happy to report I've found the perfect solution: Pacific Pickle Works! Their products are sure to impress everyone from your father to the party hostess, and will allow you to spend more time sipping eggnog! My grandmother is a big pickler. Green beans, okra and even peaches were all fair game. Maybe that's why I've always loved pickles, for the nostalgia, but also, they can be downright tasty! Well, I do draw the line at the weird pickled eggs and pigs feet you often find on the counter in Southern gas stations. Those frankly scare me. I'm happy to report you'll find neither of those at Pacific Pickle Works. But you will find an incredibly tasty (and clever!) selection. Let me introduce you to Brad Bennett, "Principal Pickle," who can tell you more about these great gift ideas, where you can find them and a little more about his company and his passion for pickles. Take it away Brad! I must confess, I was a little worried about having Holley, with her Southern tradition and taste for pickles, give us her option of our West-coast pickles, but we seemed to have passed the test! My pickling start came about 10 years ago after realizing that making olives took too much time and patience before I could enjoy the fruits of my labor. (I guess I'd make a terrible winemaker....) So as a fan of vinegar-y snacks, I tried my hand at making pickles. 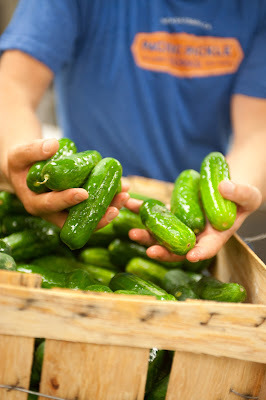 Each fall I'd make batches of pickled cucumbers, green beans or asparagus and give them as holiday gifts. After a few years, I finally refined the brine and spices that would ultimately become the recipe on which Pacific Pickle Works was founded. 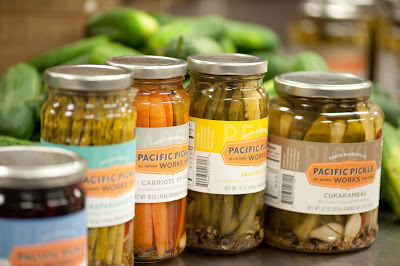 When I first started Pacific Pickle Works in 2010, along with my partner Emi Umezawa, we set out to craft a brand that would reflect a modern spin on the retro tradition of pickling from an industrial America. All of our products are packed in vinegar-based brines and have a spicy, garlic, dill flavor profile. Each jar is hand packed and among other spices includes a variety of types of pepper and chile. My favorite is our pickled beets, but be warned, Holley, these are not your grandmother's aromatic spiced beets. These are savory and pack some heat! To reflect the spicy flavors, and in order to not take ourselves too seriously, we came up with ridiculous names for each product, such as Asparagusto, Jalabeaños, and Cukarambas. This year we're adding cauliflower, brussels sprouts and okra to our lineup, as well as fennel root, which is a bit of a departure from our traditional recipe and is done in a rice vinegar-based brine and is only accented with a little fresh ginger, citrus zest and chile. Pickled vegetables make a great relish tray for an easy and delicious appetizer and food garnishes, but some of the most popular uses of our products are for drinks! Doesn't a spicy Bloody Mary with our Jalabeaño on Christmas morning sound great? Or how about an "Unbeetable Martini," which is a dirty martini with a dash of the brine and garnished with a slice of our Unbeetable pickled beets, to sip in front of the fire? For the adventurous whiskey lover, try a "Pickle Back," which is a shot of Jameson whiskey with a pickle juice chaser. Create your own concoction and share it with us! And you get bonus points if your creation comes with a clever (or ridiculous) name. Where can you get the goods? We're still selling mostly locally through a variety of Santa Barbara gourmet food retailers and grocers (see the list here), but if you're looking to ship out of town, the Santa Barbara Company specializes in food baskets and can hook you up. In 2013, we're excited to be on the shelves of Whole Food Market in Santa Barbara. Thank you, Holley, for the opportunity to guest blog and I hope I've tickled the taste buds of your readers to go out and try a jar or three of Pacific Pickle Works! Happy Holidays!